These apple pie muffins are made healthier with Greek yogurt, coconut oil, and whole wheat flour. Plus these muffins have an optional cinnamon oat crisp on top made without butter! And while I’ll still be savoring the last bits of summer, I basically had two summers (Australia’s summer and now Utah’s summer) so I’m good and ready for Fall. To be honest, I’ve been pretending it’s Fall since about the beginning of July when I broke out the pumpkin and started experimenting on recipes for you all. So far I have about 9 different pumpkin recipes that I can’t wait to share with you all. But it would be rude to rob apples of their lime-light so let’s start with some apple recipes! First one up, these delicious and healthier apple pie muffins! Last year the blog debuted some apple almond muffins that were very well received. We LOVE those muffins! They are flourless and even healthier than these ones. However, these have tons of healthier swaps and overall these two recipes are very different. The flavors, ingredients, textures, pretty much EVERYTHING is different between these two muffin recipes. Besides the apple part – they do both have apples! These muffins are made to imitate a bakery style muffin but in a healthier way. They’ve really got the softness, taste, and texture of your typical bakery muffin but with probably a third the calories depending on the actual bakery muffin you get. To get that softness, the secret ingredient is CORNSTARCH. It makes these muffins ultra light and soft instead of a typical denser muffin you usually get with a healthier ingredients. It’s also important to use white whole wheat flour (or plain white) as opposed to whole wheat flour which is usually a bit denser. Another way to keep these muffins soft is to keep the stirring to a minimum. As much as we all hate doing dishes, the separate bowls are pretty important to avoid over-stirring while making sure all the ingredients do get mixed together. Oh and remember how I was telling you these muffins have no butter? Then I went and put a slab on to try and make these pictures prettier. Food blogging is a weird thing! Preheat the oven to 350 degrees F. Spray 9 cavities of a muffin tin and lightly flour. Do not use muffin liners as these muffins will stick to them. Set aside. In a large bowl, pour in the flour. Remove 1 tablespoon of the flour and return it to the flour container. Add in the cornstarch, baking soda, salt, and cinnamon. Mix until combined. In another bowl, mix together a large egg (organic recommended for flavor purposes), Greek yogurt (I use apple cinnamon in these muffins and love it! Plain or vanilla will also work. Full fat or 1% for best results -- fat free tends to be a bit watery), coconut oil (measured when melted), vanilla extract, and brown sugar. (IF you are used to healthier muffins/snacks 1/3 cup brown sugar should be great for you and if not I would recommend doing 1/2 cup) Mix until well combined. Peel and finely chop the apple. Toss with the lemon juice and discard any extra lemon juice that doesn't coat the apples. Toss with the flour mixture. (this is important to keep the apples dispersed evenly throughout the muffins). Mix the wet and dry ingredients until JUST combined. Over-mixing yields denser muffins. Fill up 9 muffin cavities evenly with the mixture -- each cavity will be a little over 3/4ths the way full. In another bowl, toss together the flour, quick oats, cinnamon, and brown sugar. Pour in the coconut oil (measure when melted) and mix to combine. Add a bit more coconut oil if too dry or a bit more flour if too wet. Top each muffin evenly with this crisp topping. Fill the empty cavities of the muffin tin with water to ensure even baking. Bake for 20-25 minutes or until a fork when inserted in the center comes out clean. Remove and allow to cool for a few minutes before removing the muffins from the tin. Use a spoon to coax the muffins out after about 5-10 minutes. Store muffins in an airtight container in the fridge. Warm in the microwave for 10-15 seconds before enjoying if desired. Muffins best enjoyed within 3 days. I really wanted the apple flavor to shine through on these muffins so there isn't too much spice. If you enjoy more spice try increasing the cinnamon, and adding some allspice and/or nutmeg. Mmmm I am excited for apple season! Love that you used Greek yogurt in these beauties. I’m so ready for fall too, but I’m not ready for what comes after that! 🙂 These muffins look fantastic, Chelsea! I love that there is no butter in the topping and that they’re made with Greek yogurt. Yum! As much as I will miss all the summer berries, fall is my favorite baking season too 🙂 I love these apple muffins, Chelsea! They’re gorgeous and I’m swooning over the cinnamon sugar topping! oh my gosh! apple muffins sound good enough but that crumbly topping I mean drooling over it! toppings alwaysss get me! 😉 this looks delicious Chelsea! I am SO READY for fall! I’ve already been baking all the apple and pumpkin things… I AM SO PUMPED. 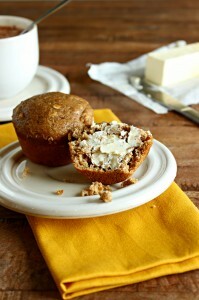 These muffins look majorly delish, and I LOVE that you used Greek yogurt! Pinned! Perfect to start the fall season, I would enjoy these gladly for breakfast with some warm cider on the side! I am so ready for fall! I can’t wait for all things pumpkin, cinnamon, and such. These muffins look amazing, pinning right away! Thanks for sharing. I am so amazed at how well this recipe turned out! 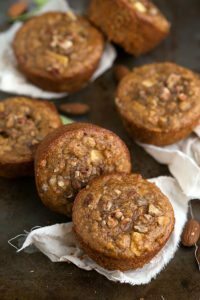 I’ve tried so many different types of healthier muffins in the past and they were never quite right, but these were perfect! My kids just started school this week and breakfast is always a struggle. They don’t like cereal (especially when I won’t buy the high sugar kinds) they don’t like toast, eggos, granola bars, eggs, or most typical quick breakfast options….so we made muffins. These were fluffy, delicious, the topping adds just a little sweetness without going overboard. Now, I just need to go find this “white wheat flour” I keep reading about so my next batch will have more fiber. P.S. I’m trying to rate your recipe 5 stars, but for some reason, it’s not working for me. Aw thank you so much Jenny!! What a sweet comment! 🙂 So glad to hear your kids enjoyed them! Can I make these without the coconut oil? I would not recommend leaving out the coconut oil, but you could try a different oil in place of coconut such as canola or vegetable oil. I haven’t tried either one so I can’t say for sure if the taste or texture will be different but better than leaving out that ingredient entirely! Just made these substituting King Arthur gluten free flour for my mom who is celiac! They were AWESOME! Yeah!! So great to hear 🙂 Thanks for the comment! These muffins are awesome! If I could give these more than 5 stars I would! I made them last night and put them in the freezer. Pop them in the microwave for 45 seconds and they are perfect. I just ate two of them and could probably eat the whole rest of the batch. The batter was very thick, so I was not expecting them to be so light and fluffy with a lovely crispy top and edges. I used AP flour, 1/3c brown sugar, and one 5.3oz nonfat apple pie greek yogurt in the muffin part; for topping used 1 1/2T butter, 2T quick oats, 1/2t cinn, about 1 1/2T brown/dk brn sugar, about 2T flour (started w/1T and added until right consistency). 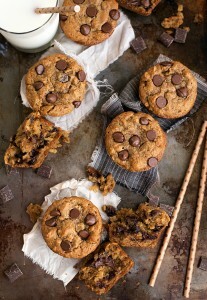 Thanks for another awesome muffin recipe and for the healthy swaps, keep ’em comin’! You are so sweet Robin!! I so appreciate your kind comments and trying so many recipes!! So glad you enjoyed these muffins 🙂 And your crisp topping sounds amazing!! These muffins turned out great! Really nice and soft. Not dense like many of the other healthier muffins I have tried! Good flavor but I would probably increase the amount of cinnamon….but thats just my taste. I will definitely be making these again. Thanks for the great recipe! Found this recipe on pinterest and made ’em, can’t describe how delicious they are. Possibly one of the best recipes I’ve found in a while! That is so great to hear! 🙂 I’m glad you enjoyed these!! Does anyone have the nutrition facts on these? Thank you! happy, this comes out very nice… i don’t have coconut oil so used corn oil instead… the crust part is a bit different, maybe too wet… and the sugar become “rocky” rather than like a crispy crumb… maybe i should get myself some right ingredients 🙂 thanks for the recipe. I’m glad you enjoyed these! And yes I think the crust part will come out much better when you try the coconut oil 🙂 Thanks for the comment! Hey! I’m not a big fan of using sugars and like to use honey instead. Do you think that would work? How much do you think? I’m not sure how you would replace the sugars with honey since I haven’t tried that in this recipe. I’m guessing it would be a bit more dense and not have the rise that these do. And I’m sorry, I couldn’t suggest an amount to use without further recipe testing since I don’t want to say something that might not have stellar results. Just made these and they are UNREAL! So light and fluffy. Thank you for being so detailed in your instructions. It helped me so much. I used avocado oil instead of coconut oil and used plain Greek yogurt. I used a half cup of brown sugar but I will probably use a bit less next time to try to make them even healthier. Do you know the calorie/muffin on the recipe approximately? I try a lot of random recipes online and this is first I’m printing out because I don’t want to lose it! Used gluten free flour, only 1/4 cup sugar, plain yogurt, and no topping and they are perfectly soft and tasty! Wow! What a compliment! 🙂 I am so thrilled these were a hit! Thank you Amy! What a great recipe! I decided to see if this would work as a quick bread rather than muffins. No change to the ingredients, but baked it in a loaf pan at 325 for 40 minutes and tented the top with tinfoil for the first 20 minutes so the topping wouldn’t overcook – perfect! Your cornstarch substitution is genius. Thanks Chelsea for the recipe. The muffins tasted so yummy and moist. I substituted the yogurt with milk kefir . So delicious! I made them this morning and doubled the recipe. I did one cup apples and one cup shredded carrots! I also skipped the topping. Some of the bottoms were a bit soggy- but that is my fault for adding too much water lol!!! I ate three! Delicious thank you Chelsea! I used spelt flour and a combo of coconut oil and ghee and put it together in the Thermomix. All of us, inc my 6 and 5 yr old really enjoyed them. This is a quick and healthy dessert for my kids and they absolutely love it. These muffins were the stars on tonight dinner! Thanks you Chelsea! So happy to hear that! 🙂 Thank you for the comment Robert! I just made a batch and OhMyGosh delicious!!! I substituted the brown sugar for dextrose powder and a bit of rice malt syrup to make it a sugar free muffin. I think the cornstarch and greek yoghurt make this a very special recipe. Even with the adjustments this is so moist and fluffy and still sweet. Great recipe thank you! Thank you so much for your review and comment Danielle! 🙂 Glad you liked the muffins! I use Greek yogurt so I don`t have to buy probiotics. Greek yogurt is very nutritional and healthy. I just wanted to know what the nutritional value of these muffins are. These muffins are delicious! I shredded my apples because I was too lazy to dice them. They turned out perfectly moist, and the crunchy topping makes them even better! Thanks for the recipe! Hi Chelsea, thanks for the recipe! It looks so good. I was wondering: any ideas on how to adapt the recipe to mini muffins? Thanks again! I used white whole wheat flour, vanilla Greek yogurt and canola oil. I cut the apples up very small. They muffins are a little drier than I would like. Maybe I’ll put in some shredded apple next time in addition the the chopped apple. It made 13 muffins with the yellow scoop. Took 17 min to bake at 350F. Sorry these were drier than you’d like; the shredded apple sounds like a great idea!